Investment in this project which is akin to mobile hotel room in Rajasthani Haveli style will be invited from private investors. The palace on wheels is and extremely popular venture, but more flexible and smaller camper vans especially designed for use in the desert area are an attractive option. For use throughout the state. 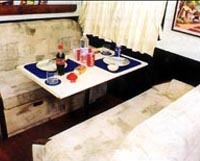 Since there are no camper vans or reconverted trucks/buses, such 1 and 2 lakh, a two-bedroom one Rs 16 lakh.